Russia's threat to the international community is "real" and "active", the head of GCHQ has warned. Jeremy Fleming's comments came after the US, France, Germany and Canada agreed with the UK that Russia was behind the Salisbury Novichok attack. In a speech in Washington, Mr Fleming said Russia's desire to "undermine" international law was "brazen". At a UN Security Council meeting to discuss the attack, Russia dismissed evidence presented by the UK as "lies". Mr Fleming, the director of the government's cyber intelligence agency, said GCHQ had supported police in a "painstaking" and "highly complex" investigation into what happened after the poisoning of former Russian spy Sergei Skripal and his daughter Yulia in Salisbury, Wiltshire on 4 March. 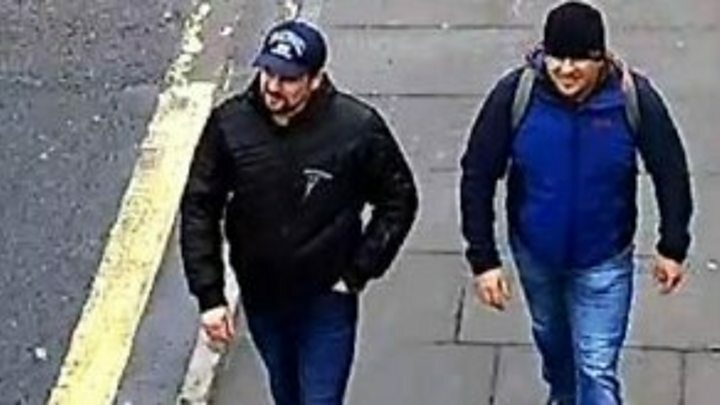 The UK named two men, Alexander Petrov and Ruslan Boshirov, believed to be from Russia's military intelligence service, the GRU, as the main suspects. The Kremlin called the accusations "unacceptable". But Mr Fleming said: "The threat from Russia is real. It's active." He added: "And it will be countered by a strong international partnership of allies. Able to deploy the full range of tools from across our national security apparatus." Could suspects be returned to the UK? 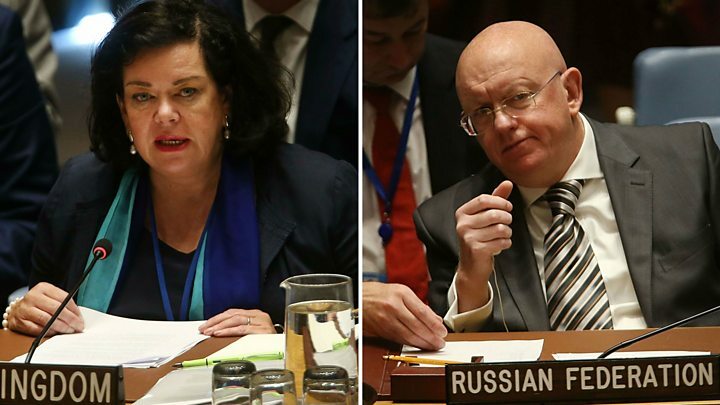 Speaking to BBC Radio 4's Today programme, Britain's ambassador to the UN, Karen Pierce, said she was "really disappointed" that Russia was refusing to engage or acknowledge the seriousness of the situation. She added that Russia "often only has a negative agenda" with regards to international affairs. A statement from Emmanuel Macron, Angela Merkel, Donald Trump, Justin Trudeau and Theresa May said on Thursday: "We, the leaders of France, Germany, the United States, Canada and the United Kingdom, reiterate our outrage at the use of a chemical nerve agent, known as Novichok, in Salisbury on March 4." The leaders welcomed progress in the investigation, but urged those with more information to contact the UK authorities. "We have full confidence in the British assessment that the two suspects were officers from the Russian military intelligence service, also known as the GRU," the statement added. Referring to the expulsion of Russian diplomats from their countries in response to the 4 March attack, the leaders said they had already "taken action together to disrupt the activities of the GRU". The leaders said the link to the GRU - revealed on Wednesday - would strengthen their intention to work together against foreign spy networks, the use of chemical weapons, and to "defend ourselves from all forms of malign state activity directed against us and our societies". BBC Moscow correspondent Steve Rosenberg said Russia was "viewed increasingly as a rogue nation" by the West, adding that status would "grate" with the Kremlin. The UN Security Council, of which Russia is a permanent member, alongside China and UK allies the US and France, met in New York to discuss the latest progress in the investigation. Addressing the council, Ms Pierce, said the nerve agent attack was a "direct challenge" to the "rules-based international system that has kept all of us safe since 1945". In a lengthy rebuttal, Russia accused the UK of "disgusting anti-Russian hysteria". Russia's ambassador to the UN, Vasily Nebenzya, accused the British authorities of "Russiaphobia" and misleading the international community and UK citizens. "We have lost all hope in finding the truth," he said, adding that the latest developments were "invented out of thin air". He highlighted a number of so-called "inconsistencies", which he said were "off the charts", in the UK's evidence. Mrs May told the Commons on Wednesday that the two suspects had entered the UK on Russian passports. The prime minister told MPs the poisoning was "not a rogue operation" and was "almost certainly" approved at a senior level of the Russian state. Prosecutors in the UK believe there is sufficient evidence to charge the pair with offences including conspiracy to murder; attempted murder and the use and possession of Novichok contrary to the Chemical Weapons Act. Russia does not extradite its nationals, but a European Arrest Warrant has been obtained in case the men travel to the EU. On Friday, Wiltshire Council confirmed decontamination work had begun at Mr Skripal's home in Salisbury, where the nerve agent is thought to have been deployed. The council said the work would be carried out by specialist military teams, possibly supported by specialist contractors. Mr Skripal, 66, and his daughter Yulia, 33, were poisoned with Novichok on 4 March. Det Sgt Nick Bailey also fell ill after responding to the incident in Salisbury. Police have also linked the attack to a separate Novichok poisoning on 30 June in nearby Amesbury, that led to the death of 44-year-old mother-of-three Dawn Sturgess and harmed her friend Charlie Rowley.